With emerald water of Indian Ocean and characteristically pristine golden beaches, it shouldn’t be too hard to digest why Koggala is becoming one of the up-and-coming holiday hotspots in Sri Lanka. Apart from being home to a wide diversity of marine life, this coastal town offers a kaleidoscope of experiences for all. To make sure you enjoy the best of Koggala, check out our Koggala Travel Guide below. How to get to Koggala? Nestled within the Galle District in Sri Lanka’s Southern Province, Koggala is 139 km away from Colombo, the country’s commercial capital where your journey begins. The quickest way to get from Colombo to Koggala is to take a taxi which takes approximately 1 hour 45 minutes. The cheapest way is to board a train from Colombo which takes 3 hours and 5 minutes. It costing merely ‎LKR 50 – 170 (0.28-0.94 USD). The train services, operated (3 times a day) by Sri Lanka Railways, depart from Colombo Fort station and arrive at Habaraduwa station in Koggala. 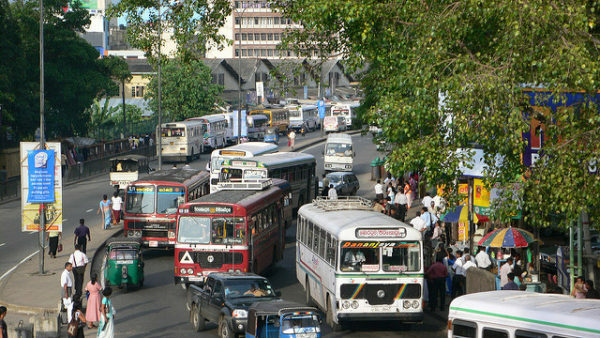 Lastly, National Transport commission operates a bus from Colombo to Koggala every couple of hours. It costs LKR 550 – 750 (3-4 USD) and takes 4 hours and 15 minutes approximately. 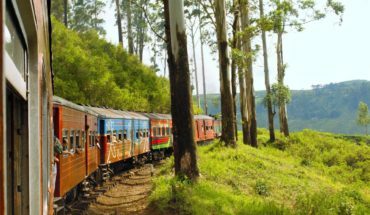 Alternatively, if you are coming to Koggala via Galle, then you can rely on the train services that take approximately 35 minutes and depart every four hours. Moreover, you can also opt for a bus or taxi and mark your presence in the beautiful town of Mirrisa within just 20 minutes. 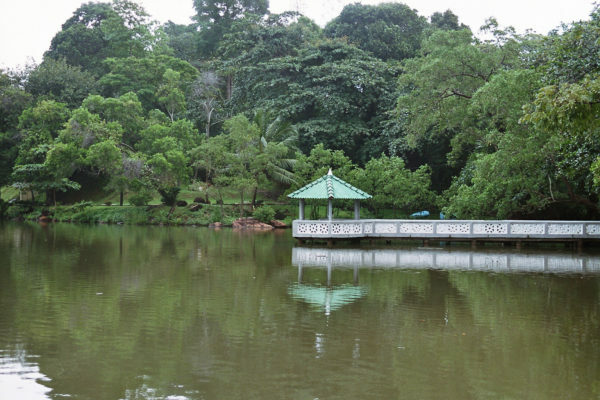 The beautiful lake is fringed with lush green mangroves and embellished with small tropical islands. A boat safari or a catamaran ride across the Koggala Lake makes you feel like Columbus unveiling the sanctuary of untouched nature. Couple this thrilling ride with the mesmerising sunset when the sky is awash with gorgeous colours. Koggala Lake is also the largest lake in Sri Lanka. As you glide through the pristine waters, experience the irresistible aroma of the finest flavorful spices at the Spice Island. This is not only a haven for spice lovers but also offers deep insight into the indigenous lives of the locals. The sail is also a great opportunity to observe the abundance of birdlife in this country. Lastly, the boat ride includes a stop at the tiny Buddha temple where visitors can pay witness a number of frescoes depicting Buddha’s life and pay their respects at the sacred shrine. Embrace yourself, Voyagers! Here’s a postcard-perfect beach that packs the warmth of golden sand beneath your feet and icy cool breeze caressing your cheeks. 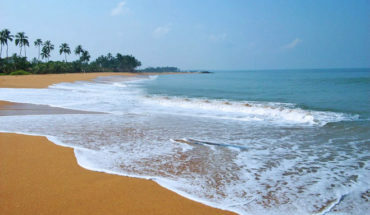 An uncluttered paradise with crystal clear azure waters of the Indian Ocean, the Koggala beach is an idyllic place for the water babies and beach bums looking to bid adieu to their worries and enjoy some breath-taking moments as they have always wanted to! The beach is also an ideal location to pump your adrenaline by snorkelling and diving. If you like beach running, the pristine coastline makes a beautiful route as you take an invigorating jog down the beach and see the subtle silhouettes of skilled stilt fishermen towering over the Indian Ocean. The best time to visit is July end to October. Keep your eyes open to witness the rare species of turtles- loggerheads and leathery turtle. The Martin Wickramasinghe Folk Museum complex is a small world on its own that offers a fascinating glimpse of Sri Lanka’s rich history and varied traditions. Dating back to 200 years, this museum marks the restored home of the famous local writer – Marin Wickramasinghe (1890-1976). The museum is a glorious repository of ancient and modern artefacts that seek inspiration from Dutch architecture that extends all through the art gallery. What’s more? It boasts of another interesting section that showcases costumes, instruments, masks, puppets, metal craft and even kitchen utensils that help keep the people of Sri Lanka connected to their roots. The locals help the voracious readers get an insight into the author’s literature going through the collection of photographs and memorabilia. Moreover, what makes this museum a must visit is its natural setting amidst hundreds of indigenous trees and abundant bird lives that breathe life into the works of Martin. This tasteful panoply is indeed the icing on the cake. 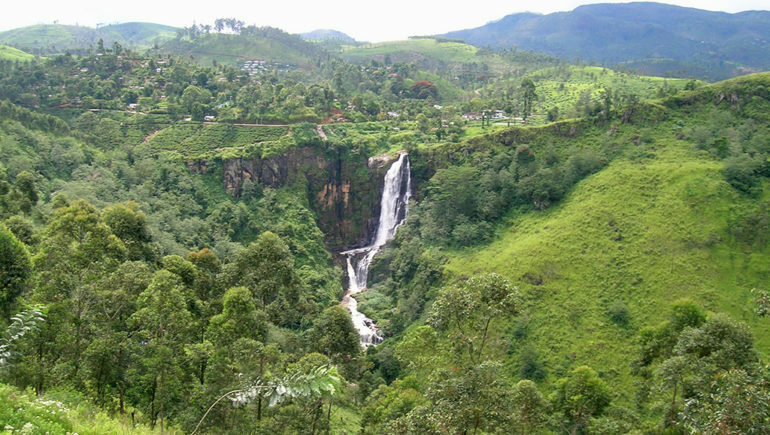 Opening hours: Everyday from 9.00 a.m to 5.00 p.m.
An appealing vestige of Sri Lanka’s colonial heritage, Hundunugoda Tea Estate is one among the top-rated tea plantations in this tear-drop shaped country. 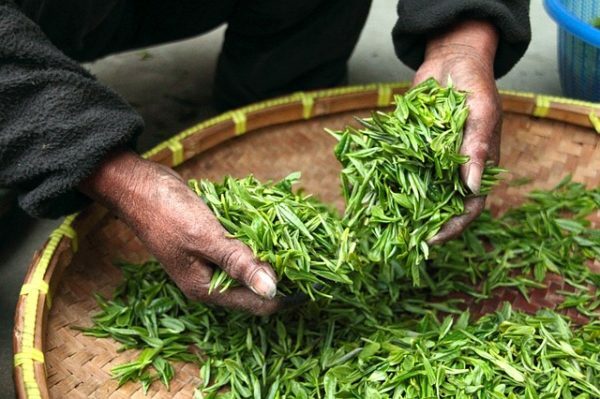 It has established itself as an artisanal producer of some of the finest handmade whole-leaf teas. The highlight, however, is a ‘tea never touched by human’!!!! Yes. You got that right. Never! This elusive Virgin White Tea rich in antioxidants was once served exclusively in an Imperial court of China. In the past, the leaves could only be picked by virgins. While that is no longer the case, it remains that the tea does not come in to contact with the human body throughout the whole manufacturing process. In addition, lighter green teas, rich aromatic black teas and revitalizing zesty fruit flavours enthrall everyone from novice to aficionados and connoisseurs. A lovely walk in the immaculate plantations and an instructive tour of the tea factory is followed by tea appreciation program which is free of cost to all the visitors. Relish a complimentary luscious cake with a cup of freshly brewed tea at the end. In fact, one of the machines in the factory is an exclusive production from the manufacturer of THE TITANIC. A small work indeed! Add charm to your brief stay at Koggala by visiting Turtle hatcheries – home to a gamut of fascinating, but endangered turtles. Did you know 5 out of 7 endangered turtle species can be encountered in Koggala turtle hatchery? It’s a truly magical moment to see these creatures in haven away from the poachers. 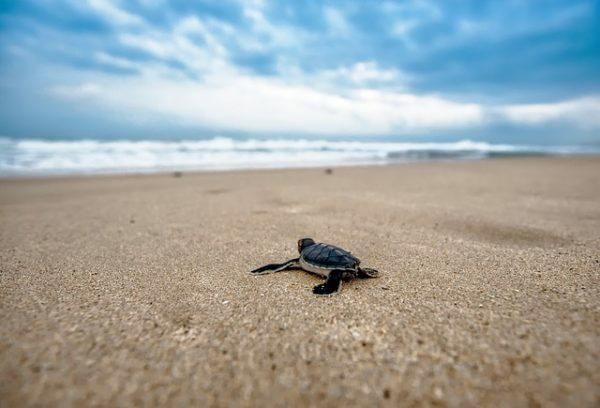 Moreover, you’ll get an opportunity to polish your knowledge about the significance of conserving sea turtles by participating in informative tours. You get a remarkable experience being a part of something bigger to make a difference in the world. The stellar experience is releasing the adorable baby turtles, fit to adapt, in the lap of nature to where they belong and watch them flop about starting a new itinerary. It is a blissful moment to cherish- a noble act of liberating turtles. 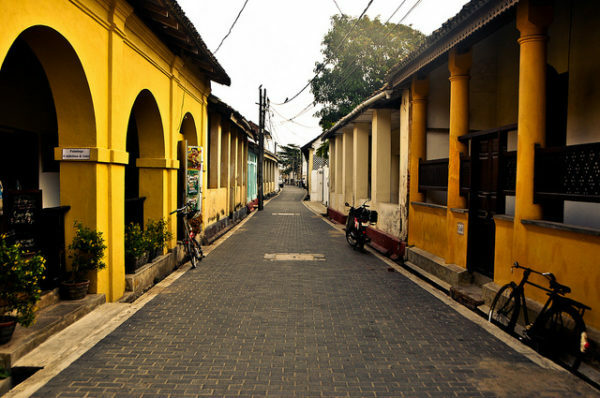 Explore the magnificent beauty of the Galle Fort- a UNESCO World Heritage site and immerse yourself in the delightful culture of this living heritage. Constructed by the Portuguese, fortified by the Dutch, modified by the British and finally restored by the Sri Lankans after Tsunami, Galle Fort is by far the best surviving European fort in Asia. Visiting historic museums and beautiful churches can be done within this colossal fort while strolling and capturing every splendour sights. During the walk in the fort’s premises, it is hard to miss the majestic clock tower where time seems to stand still. The grandeur of the fort is amplified with the monumental ramparts that lay testimony to the glorious Lankan history. Moreover, once sleepy Galle Fort is now vibrant with tourists who perch on the roofs and the balconies to witness the mighty sun disappear into the horizon of the Bay of Bengal. It is indeed an alluring sight to look at. After sightseeing at the fort, you can check out the city’s endlessly rambling lanes and experience the dynamics. 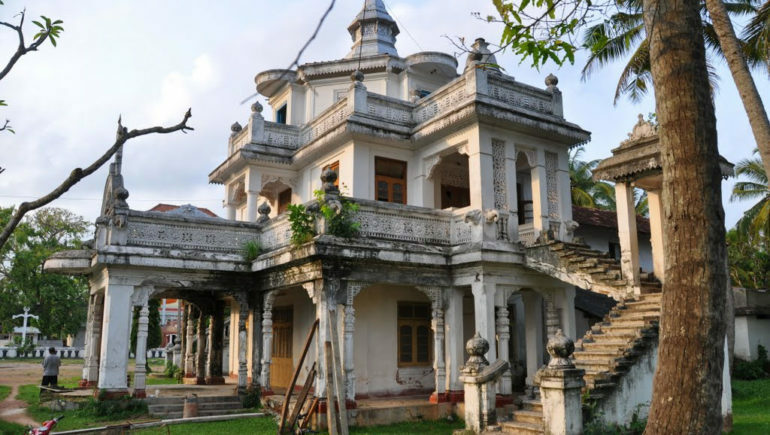 No trip to Koggala is complete without paying a visit at the Kataluva Purvarama Temple where a stunning bit of ancient architecture awaits you. While the temple boasts of numerous Buddha statues and Hindu gods, it is extremely popular because of the beautiful, serene shrine full of Kandyan-style murals from the 13th century. An absolute treat for art enthusiasts! In fact, this is an idyllic place to visit after the refreshing beach fun, simply because it promises to bid you some spiritual moments in tranquillity. Inside the temple, a private tour by the monk is all you need to know the details of the murals that will leave you enlightened by the end of the tour. While the murals of the Jataka tales are absolutely jaw-dropping, you’ll be amazed by the gripping stories behind each of the paintings. What makes this pious destination even more interesting is the fact that it features wall paintings of Queen Victoria, illustrating the colonial influence on the earlier maritime society. P.S. The temple promises to take you 128 years back into time, thanks to the splendid architectural elements harmoniously incorporated into the pictures. Dikwella is just a tuk-tuk away from Koggala and many travellers flock to this must-visit place for the best souvenirs to take back home. What’s so special, you may ask? Well, it is Lace! Dikwella is on limelight for the revival of the orthodox way of making beautiful and elegant lace. Dikwella Lace Centre provides an authentic and fair trade craft experience to the tourist. 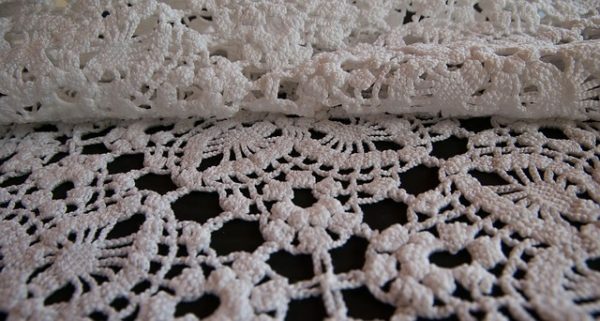 You can witness one of the most conventional ways of making lace- beeralu and get more information about the significance of lace making in a tour at the center itself. From table handcrafted silk cloths to children’s toys made of silk, there is a wide range of laces available, which is something you don’t get in the stores around the corner. A visit here will make you feel closer to the locals and humble for contributing to the well-being of the skilled lace makers. 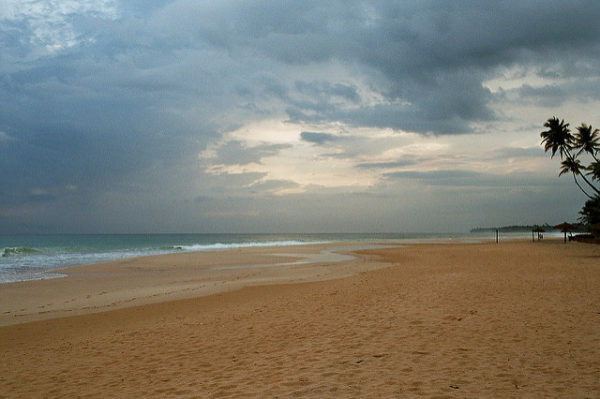 Koggala is in the spotlight for whale watching as Mirissa is just a few kilometres away. Watching the mammoth creatures is a thrilling experience that is beyond words. From Killer whales, Spinner dolphins, Sperm whales to the largest animal on the planet- the gigantic Blue whale, sightseeing these beautiful creations of nature from a cruise is definitely an activity you can’t afford to miss. Water in this area is rich in plankton which whales feed on, so there is always a chance to see these mammals every time they show up on the surface for air. 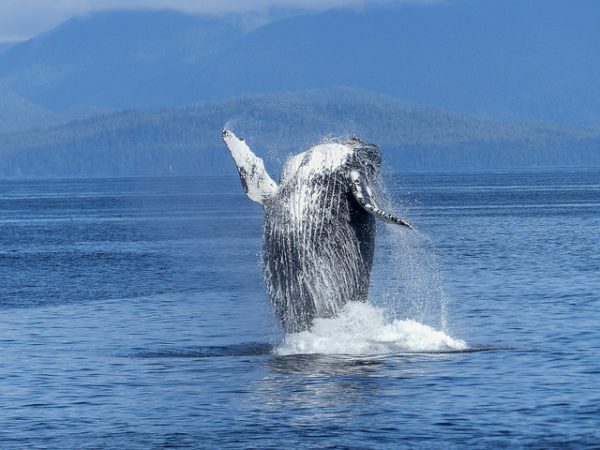 It is best to go for whale watching when the ocean is warm and calm from November to April. It is not recommended to visit the waters of Mirrisa in between May and October when the ocean is rough and whales are rarely spotted. 10. 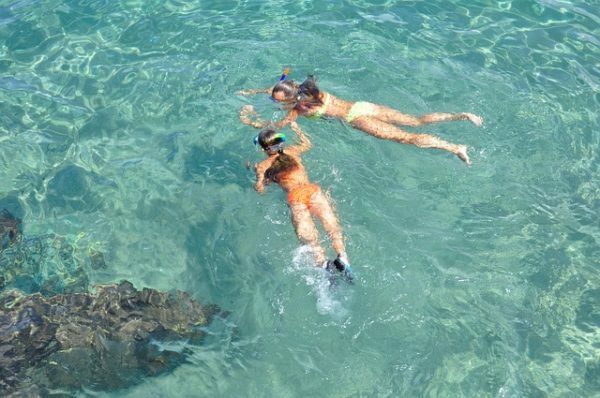 Snorkelling: Experience the Magical marine life in person! What’s more? While the Koggala beach still remains unexplored by many travellers, its pristine beauty and seclusion make it desirable by snorkellers. In fact, snorkelling amidst the crispy blue water will truly be an extraordinary and exhilarating experience that will not only enrich your soul but also give you memories that will last a lifetime. Whether you are an amateur or a pro, snorkelling in Koggala beach is a must-have-experience amidst undaunted coastal beaches. November to April is best if you want to witness the most of the underwater world. However, adventurer junkies prefer April and September due to the visibility if offers. 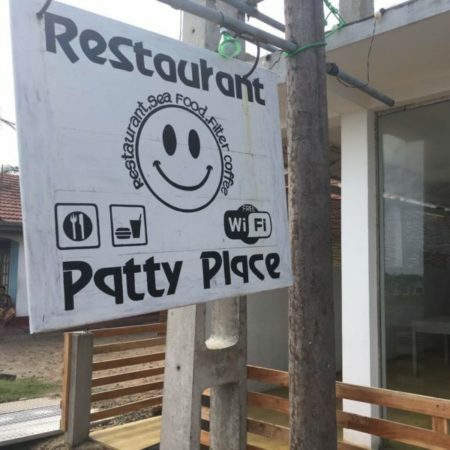 One of the most liked places in Koggala, the ‘Restaurant Patty Place’ boasts of a simple and unpretentious diner just off the beach along the main road. The restaurant serves a range of sumptuous dishes from fresh and delectable seafood to international favourites-thin crust pizzas. The option of different cuisines is accompanied by a warm welcome and friendly, genial waiters. Hygiene of the restaurant place is nothing to worry about: A neat restaurant with subtle interiors, it is guaranteed to double the delight of your meal after an exhausting day at the beach. The location of the place is perfect to enjoy the view of the sea while savouring perfectly served succulent food. Moreover, the price is worth every dime for the generous portions they dish up. You must now be aware of what the name entails- the unparallel sight of the stilt fishermen in a deserted beach. This famous restaurant is renowned for its tender and appetizing seafood, depending upon the catch of the day. You can feast on the rich scrumptious variety of fish, prawns, calamari, and if you get lucky even lobsters. 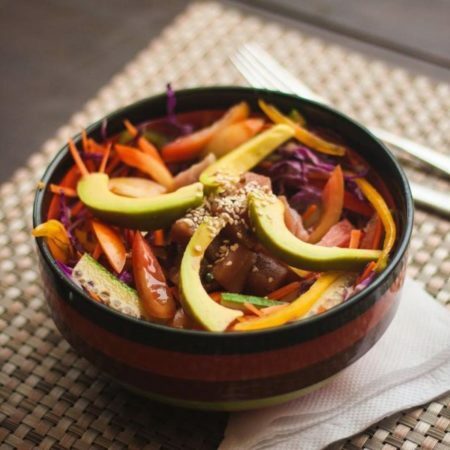 This is beautifully served with hot steamed rice and fresh crunchy salad. Inviting, isn’t it? Moreover, the value for the portion is modest too. Another pick of the beachfront is the diner with a name that is difficult to enunciate- Wiener Dschungel radiates aroma of the mouth-watering meals in the most relaxing setting. The savoury Singhalese cuisine and seafood will leave your taste buds wanting more. The place boasts of the incredible seafood platters that blow your mind in the first bite itself. The best part about trying this place is that you can enjoy the meals soaking up the sun under the palm trees on the beach. Treat your eyes with the aesthetic view of the blue waters of the Indian Ocean whilst you satiate your hunger. The reason why Catalina Grill is a must try is because it is established in an Avro Aircraft at SLAF Unit Koggala. Fancy, isn’t it? The menu here is same as in other eateries, but you must try their absolutely divine seafood. The taste will take you off to heaven. Sri Lankan dishes follow the favourites at this unique place. The gigantic blue plane right next to the entrance is a perfect location to take a shot for your Instagram before you experience food coma. The great ambience of the place is amplified by the pipe music provided at the restaurant. Nestled in a well-kept gorgeous garden, Cafe Ceylon prides in satisfying the customers. As expected as in other most-visited restaurants, seafood tops the menu at the Café Ceylon, followed by other Sri Lankan and international cuisines. A must-try here is prawn dumplings, grilled fish with fresh seaweed and seared tuna in a beautiful colonial setting. The quality of the food here is amazing and to make the experience even better special homemade ice-cream is served the taste of which lingers in your taste buds. The accommodation you select during your much-awaited vacation can take your holiday to a whole different level. In order for you to enjoy your stay as much as you relish the cuisines and tourist attractions, we have top choices of lodgings for you. 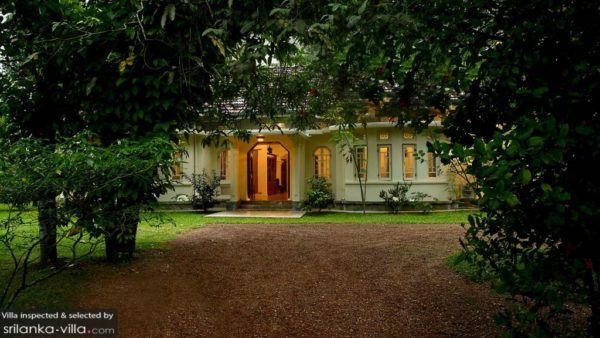 Located on the shores of the picturesque Koggala Lake, this masterpiece provides a wonderful setting with well-manicured gardens overlooking the very famous Koggala lake. The villa is in close proximity to the Koggala beach so you can enjoy the vastness of the waters, just in case if you need a break from the private pool. Build with an air of impressive colonial estate, the villa offers a perfect stay with all the basic facilities for your convenience. To make it even better there is a living room overlooking the tropical lush garden and pool area surrounded by loungers and parasols. You don’t have to lift a finger to do any chores during your stay in the villa as there will be courteous housekeepers to take care of all your needs! What’s even better? The food is prepared as per your requests to suit both your taste buds and needs. Full-time guards are on their toes to ensure your well being. A perfect place! This four-bedroom estate is nothing less than a dreamy villa that offers the perfect setting to get away from the humdrum of everyday life. This elegant lodge prides in having sparkling blue pool shimmering which, of course, is a magnet to many. With luxurious room for entertaining your entourage both indoors and out in the garden, Coconut Grove calls you to indulge your loved ones to a stint in paradise. It has all the modern luxury facilities while still having the innate homeliness that it originally intended to have. The colour is super chic and classy- crisp whites, azure blues and emerald green. So, even when you are indoors, you feel the waters of the Indian Ocean and know that you are having the time of your life in Koggala. The vintage-inspired décor in the rooms has intricately crafted canopy beds for you to enjoy a good night’s sleep after a long day of sightseeing. 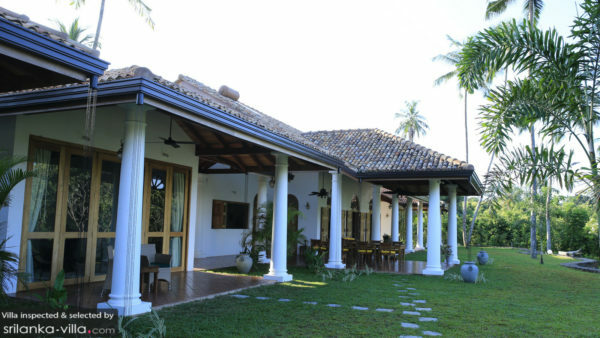 The Kimbulagala Watte Villa takes great pride in offering a peaceful surrounding overlooking the waters of the Koggala Lake. Featuring a colonial-influenced architecture, it is well furnished with modern furniture so you can enjoy the perfect holiday that you’ve dreamt of for years. The plush sofas adorn the living room which is an influence of the Sri Lankan heritage. A remarkable way to connect to the roots! The swimming pool is surrounded by four orange sun loungers to get sun-kissed when you are lazy to drive to the beach. The security is nothing to worry about and different cuisines are available at your request. Surrounded by postcard-perfect palm trees and shrouded by long stretches of rice-field, Ivory House is an impressive blend of Dutch and modern décor. Thanks to its strategic location, you can relish the local heritage and the stunning beach living in unparalleled luxury. 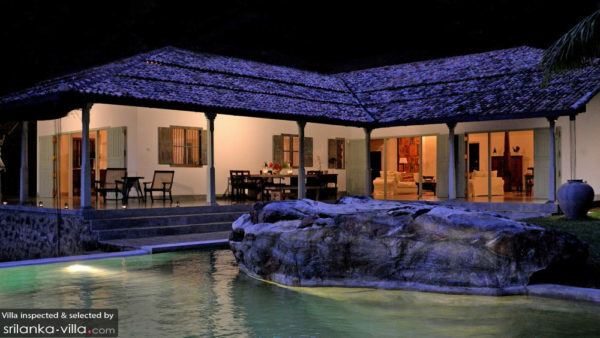 The villa also comes loaded with the goodness of a sparkling swimming pool where you can relax if you are not occupied admiring lush gardens or strolling through the aromatic tea plantation right behind the acreage. The interior is a labour of love and well maintained by the professional housekeepers. All in all, it is a perfect hideaway from the monotony of your mundane lifestyle! Now you are all set to well-versed with Koggala and set to explore the unexplored coastal town in Southern Sri Lanka like a pro, even better than the natives. 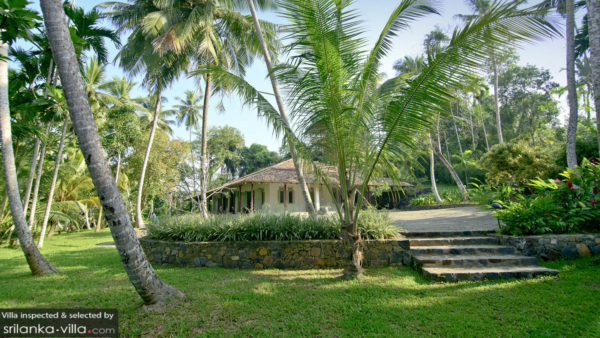 See our villas in Koggala. Inspected and selected by Villa-Finder.com.